Ok, it’s been a while. 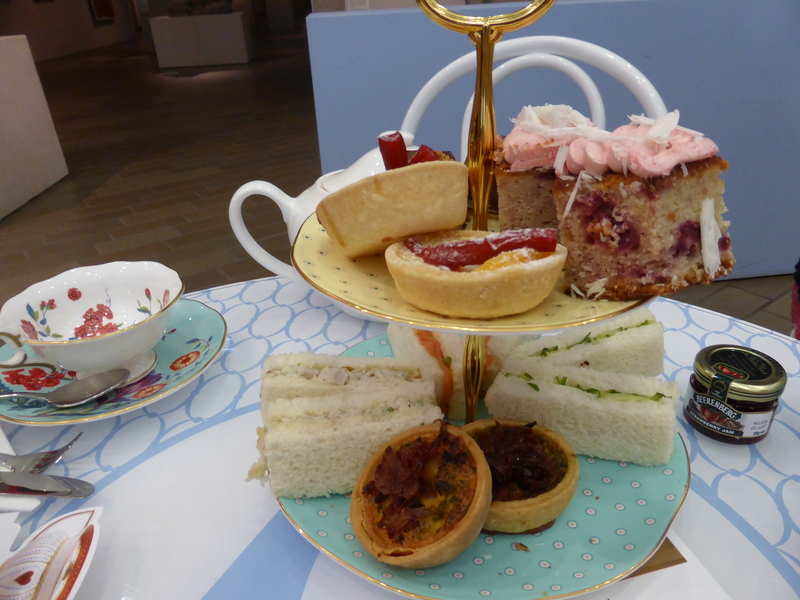 Today I went to see the Turner from the Tate exhibition at the National Gallery, and afterwards my friends and I had high tea at the tea room set up for the duration of the exhibition. 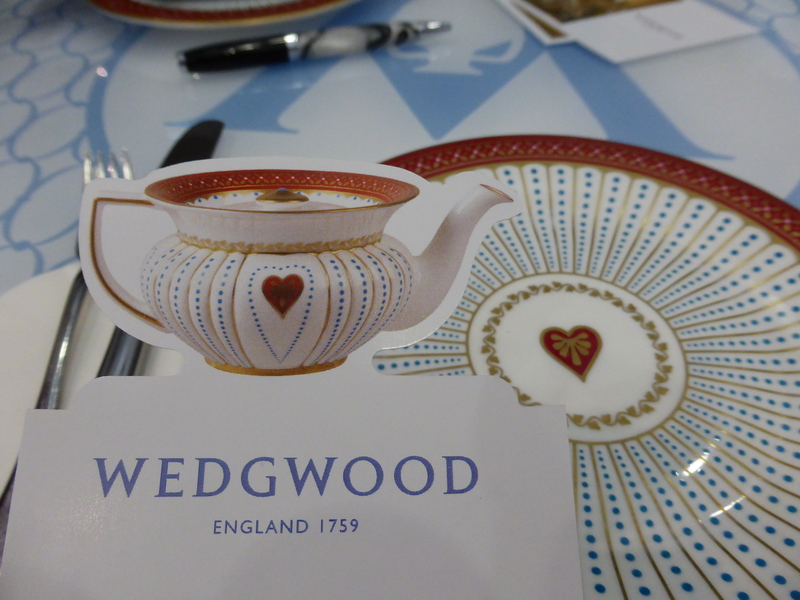 It was Wedgwood themed – squee! So, no only high tea, but high tea with classy china. And because I took so many pictures, my friends suggested that I should start a blog. At which point I remembered, oh that’s right, I already have one. That cute little card is actually the menu = amazing! We were greeted with a glass of sparkling wine, which was refreshing and tasty, and then made our tea selection from the menu. 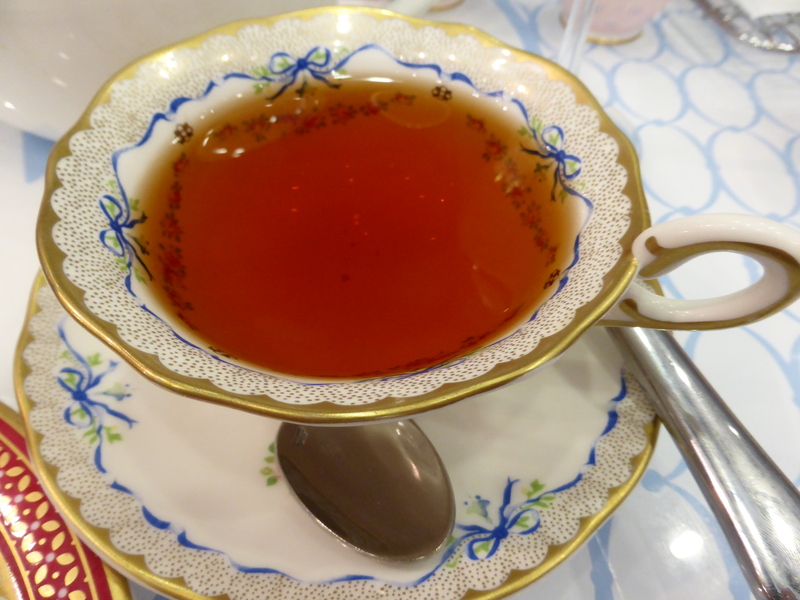 None of us could go past trying the black ‘Wedgewood Original’ tea, and it turned out to be a great choice. The tea was beautifully balanced, and only became tannic towards the end of the pot (the third cup was too strong to enjoy). 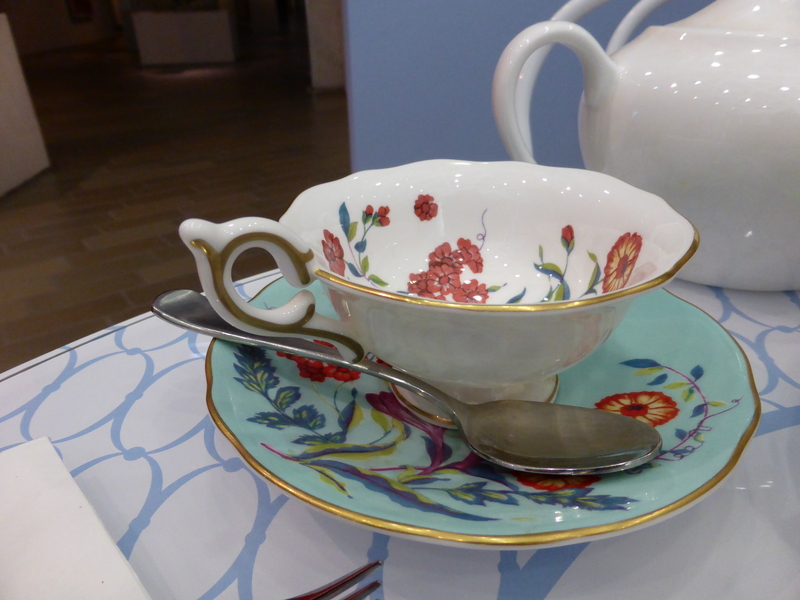 But the best part was the pretty teacups we got to drink from. My cup had cute little blue bows, while EJ’s cup had beautiful red flowers on an aqua saucer. We all loved the ‘mix and match’ approach they took to the place settings. 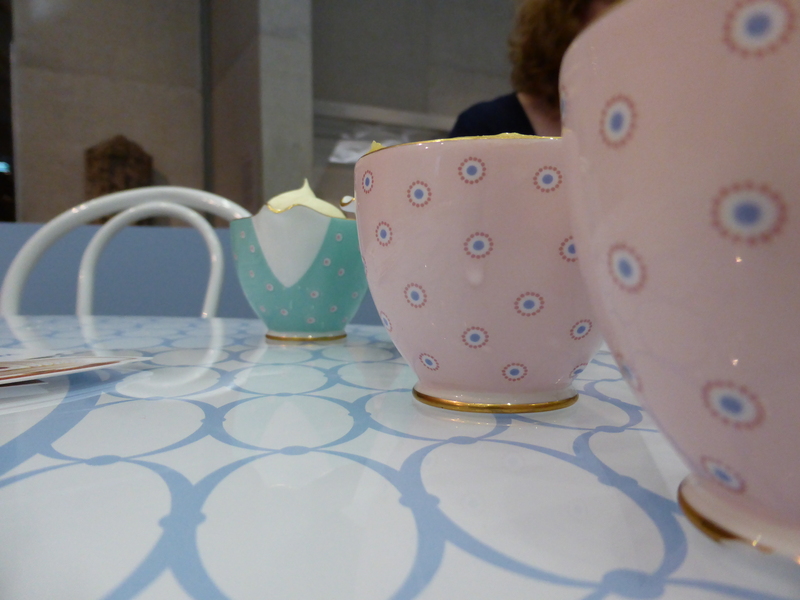 The cream, sugar and lemon curd (yes, lemon curd) came in gold rimmed pink and blue cups (adorable!). The ribbon sandwiches (cucumber, salmon and chicken) were fresh, moist and flavoursome, each with a distinct texture and taste. I always check to see if the bread is even slightly ‘crunchy’ (read: stale) and none of these were, so they were freshly made, which was impressive. The caramelised onion tart was also a treat – the onion just lifted the flavour and gave it an overall richness that was scrumptious. We then moved on to the scones – there were two each, with generous amounts of lemon curd and cream, as well as two little jars of Beerenberg strawberry jam. I only had room for one scone (should not have eaten lunch!) 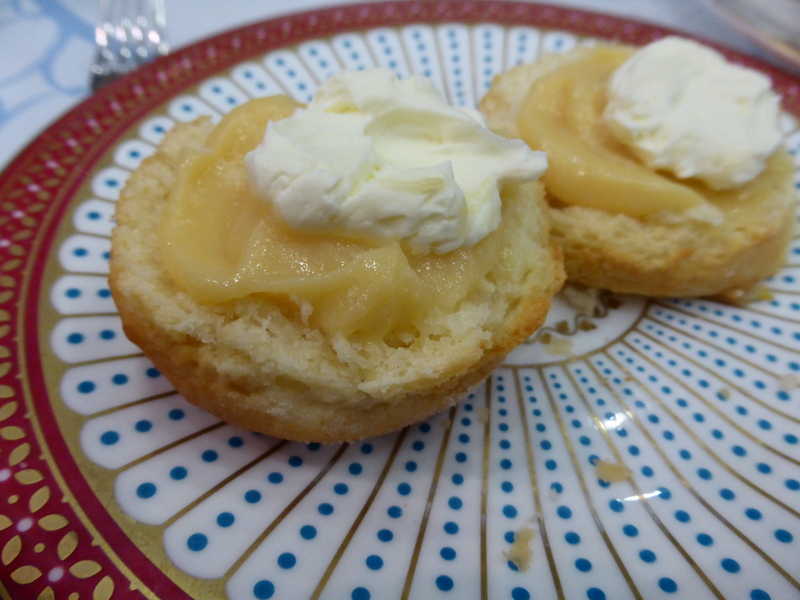 and I picked the lemon curd – it was luscious and creamy, just perfect for the firm but not very crumbly scone. Finally, as conversation moved from fine art to trashy TV, we made extra space in our stomachs for the raspberry buttercake, chocolate praline square and the orange and rhubarb custard tart. 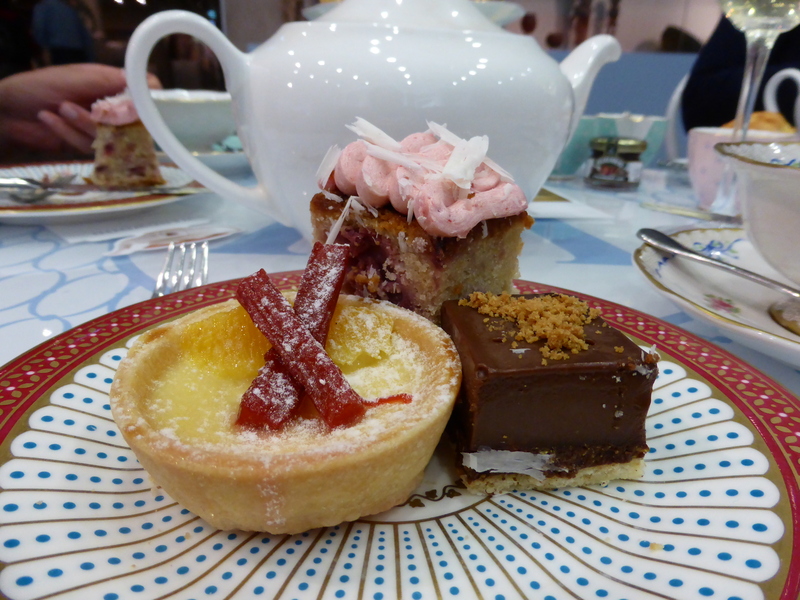 I started with the tart, which was a bit lacklustre, especially compared to the flavour of the lemon curd. But the bits of rhubard and orange on top were lovely – I didn’t end up finishing the tart (limited stomach space). Next was the raspberry buttercake. So, pretty much, give me anything with raspberry in it and I’m happy, and this was no exception. It was light, the raspberry flavour shone through and the portion was quite substantial. But the chocolate praline square took the cake, so to speak. It was rich but light, and the crunch of the praline was divine. We sat around and digested for a while, and noticed that once those having high tea had left, others could ‘walk in’ for a cream tea, which included a pot of Wedgewood tea and a serve of scones and jam. Might have to try that again soon before the tea room closes.